Amazon sellers are a breed of their own. They are proactive entrepreneurs that aim to make money by reaching the e-commerce giant’s customer base. Not a bad strategy. Amazon does the heavy lifting in terms of storing and shipping your products, gets your product in the spotlight, and allows you to scale your business fast. But none of that matters if you don’t know how to outsmart your competition. There are many components of Amazon advertising, but for basic entry-level sellers, the process starts in Seller Central with Automatic and Manual Campaigns for Sponsored Product Ads. I just threw some weird terms at you and I promise I’ll explain each one thoroughly. Sellers have to do certain things to capture that 15% that they won’t be able to predict. This brings me to long-tail vs. head terms. Head terms, or head keywords, are easy one- or two-word phrases that you already know customers will search for. For example, if you’re selling Badger Balm, “Badger Balm” would be a pretty obvious head term that will be successful every single time. They are pretty expensive terms because of their high search rate and competition. Long terms, or long-tail keywords, are going to be multi-word phrases that you can’t really predict. They will cost less than head terms because they have a low search rate with low competition. This is a nice image I found on Vizlly, a hospitality marketing agency site. 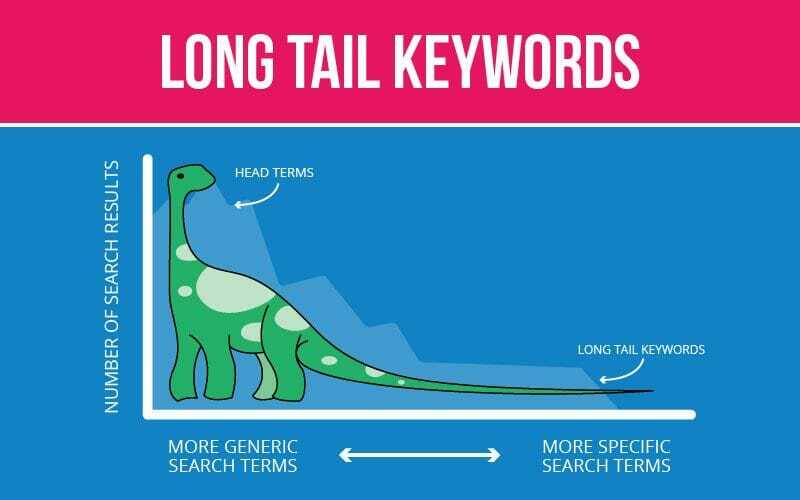 Most of the mass of the Brachiosaurus contains more generic search terms, while his thinning tail reaches out to more specific search terms. The least specific match type that reaches the largest audience. If you sell Badger Balm you will probably show up for “face balm” or “badger food.” This match type has the lowest CTR. As you may have guessed, this is the most specific match type and the most restrictive. If a potential customer searches for “Badger Balm,” your ad is only eligible for those words in that order. However, this match type has the highest CTR. These match types were made up by Google and copied by BingAds and even though Amazon is traditionally secret about how they rank ads, they do use some of the same methods as AdWords. 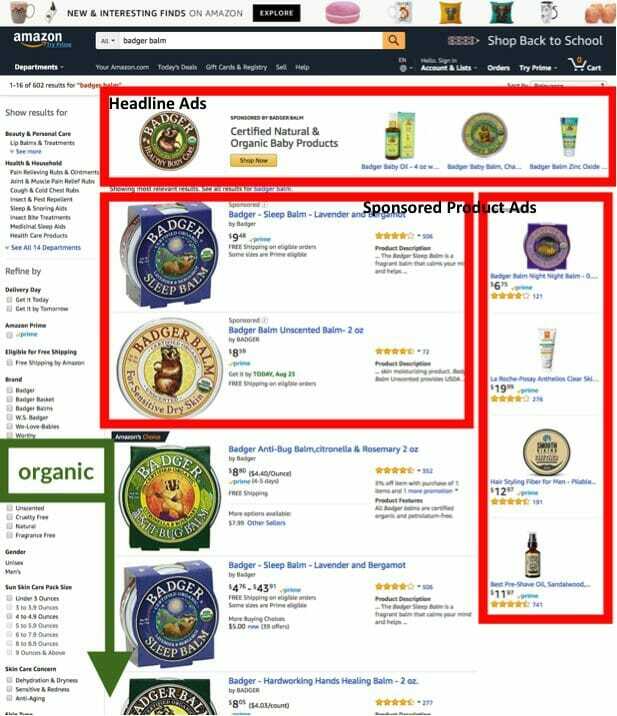 How Amazon ranks its own ads is very similar, but they do have different motives. Google wants to present ads that are closest to what is entered in a search query. Amazon wants to present ads that the searcher is most likely to buy and helps Amazon gain profit. This key difference extends the idea of what is defined as a “Quality” Ad. At the end of the day, Amazon cares about what products make them the most money and will prioritize well-performing ads over others. You have to know what gets you noticed by Amazon’s ad-ranking system. Amazon doesn’t use the term Quality Score, but they do use the same idea: combining a number of factors to influence the ranking of an ad. Learn more about Amazon’s ranking system in a recent post by Ad Badger. 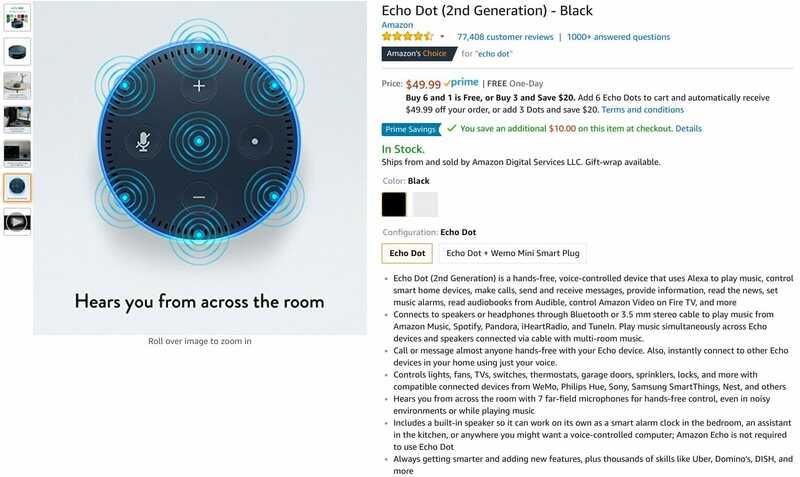 Above is an example of a great product page that has everything to convince a customer to make a purchase, including bulleted features, a clear product name, zoomable images, color options, tons of reviews, and even a product video. Yes, this is obviously an Amazon product, but that means that it’s the best example to use when creating your own product page. Headline: Also called banner ads, they’re the type of ads that appear at the top of search results showcasing one product accompanied with ad copy. Product Display: These pop up on relevant product pages. These ads aren’t targeted with keywords; instead, sellers choose product pages they want to appear on. At Ad Badger, we emphasize Sponsored Product Ads and for good reason. To figure out what terms your customers are searching for, you need to have a system in place for discovering these key terms. Yes, Seller Central is where the seller calls all the shots. Here, you set up your ad campaigns and see all the metrics associated with them. Seller Central is used by third-party sellers or individual sellers who sell to customers through the Amazon marketplace. 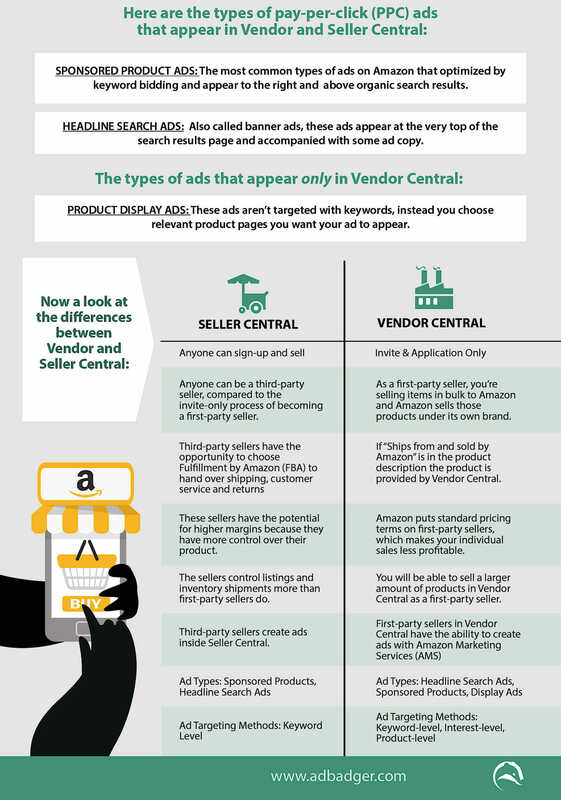 There is also Vendor Central for first-party sellers or big distributors that sell products to Amazon directly. 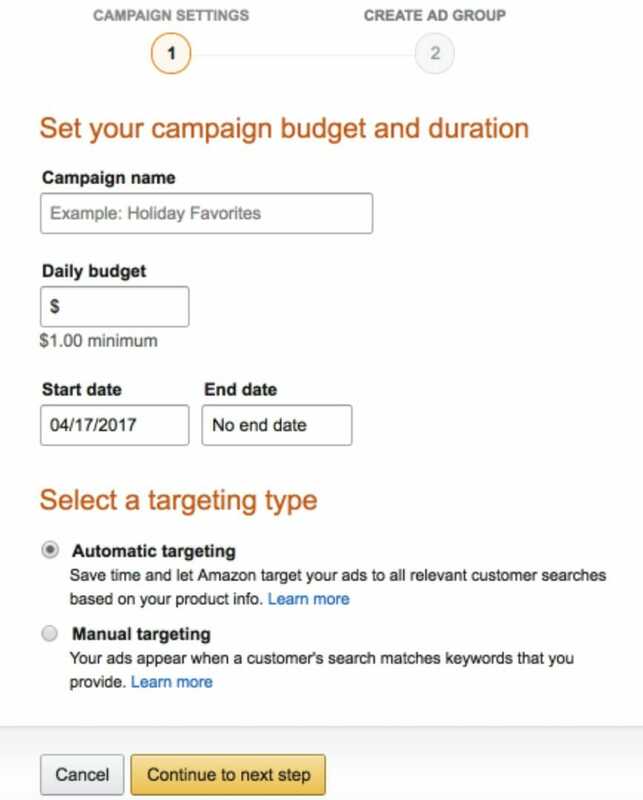 Now we can focus on Automatic and Manual Campaigns for Sponsored Product Ads and discuss why they should be your first stop when beginning to advertise on Amazon. Like I said, SPAs are extremely popular and subtle and generate really high CTRs. Amazon prioritizes these ads. If you are not prioritizing SPAs as well, you could be hurting your ROI by investing in other areas of Amazon advertising. I’m going to highlight the differences between Automatic and Manual Campaigns because it will really excel your strategy when it comes to SPAs and help you control your advertising cost of sales (ACoS). Here’s what Amazon sellers see inside the campaign manager in Seller Central. They have an option to choose “Automatic Targeting” or “Manual Targeting” for their ad campaigns, along with their campaign name, daily budget, and start and end date. 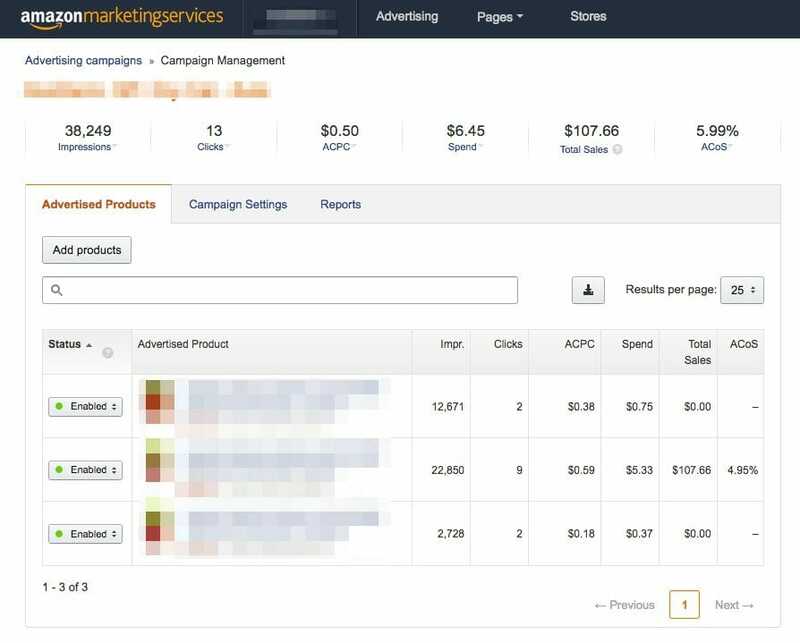 With Automatic Campaigns, sellers select budgets and Amazon automatically finds keywords that match your product’s category, related products, and your product’s descriptions. Remember when I said you should have a system set in place for discovering keywords for your products? Automatic Campaigns allow you to discover long-tail keywords you may have never guessed that people would search for. That’s why Auto Campaigns are great for beginners. Sellers can go into discovery mode and find which terms work for them. With Manual Campaigns, sellers handpick keywords they want to bid on with Manual Campaigns. Like Google AdWords, sellers can choose broad, phrase match, or exact keywords when bidding to fine tune their ad spending. When setting up your manual campaign, remember to keep your keywords in the 20-40 range and not go overboard 500+ keywords. If you choose more than 500 keywords, there’s no way all of those are going to match with your product and you’ll be wasting ad money. The acronym that you need is RPSB, which stands for Research, Peel and Stick, Block. This means finding out which keywords get the best conversion rate and moving them into a “winner’s circle campaign.” Let me explain. The research begins with Auto Campaigns. On a regular basis, Amazon sellers should download the reports from their campaigns to find out the conversion rate of the keywords they’re bidding on. Sellers can see which keywords have the highest conversion rate and put them into a spreadsheet of winning terms. You peel and stick the high-converting keywords into a new “winner’s circle” exact-match Manual Campaign. Why go through this exercise on a regular basis? To open up the door for bid optimization. By peeling out a search term from an automatic campaigns and sticking it into an exact-match Manual campaign, you can start bidding the ideal amount for that keyword – something you couldn’t do in an automatic campaign. You’ll be able to bid more on terms that convert at 20%, and bid less on terms that convert at 2%. Next, you want to block these winning terms from triggering your automatic campaign. If keywords are running in both Auto and Manual Campaigns, it defeats the purpose of the peel-and-stick step. You don’t want your winning terms still triggering in your automatic campaign. Because every keyword is bid on the same amount in Auto Campaigns, the high-converting words won’t reach their maximum profit. When all your bids are where you want them to be, you can now maximize revenue for terms that are converting well and get better ACoS. You want to be highly organized in order to grow your Amazon business and reach maximum profit. In order to do that, you need to name your ad groups and campaigns properly. 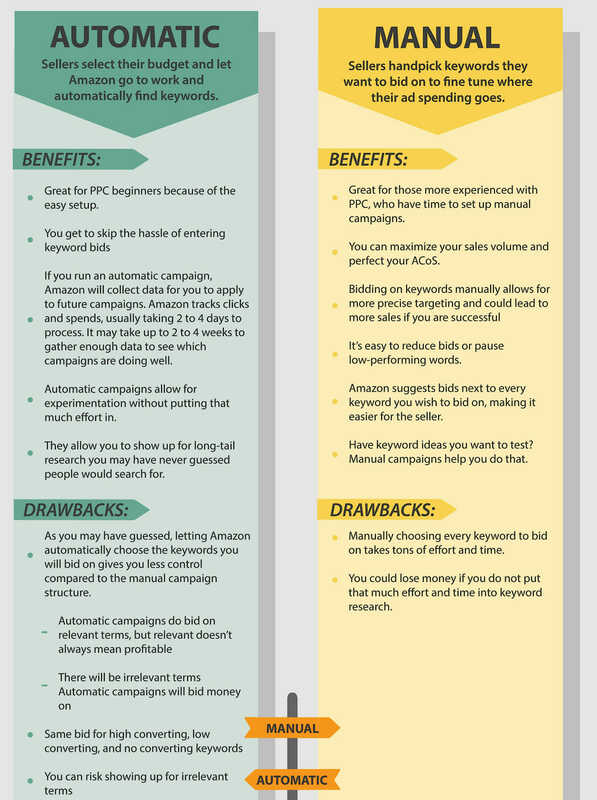 Although there are many ways the process can be improved, Amazon PPC is still a frontier for online advertising. Amazon advertising is something you have to pay attention to in order to grow your product sales. RPSB isn’t something you do once and let it run its course. But if you keep up with your account, you will gain maximum revenue. Michael Erickson Facchin has 7+ years experience in paid traffic and created the PPC tool Ad Badge to help Amazon sellers automate and improve their Amazon PPC Campaigns.